Ever since I transferred Dex to his new tank, he has grown so much bigger and at a much faster rate! 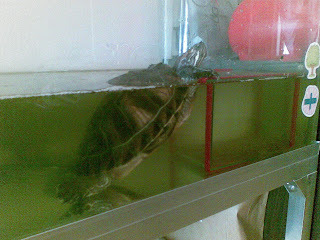 His gigantic bottle of turtle food is almost gone - I actually had to go get some yesterday just to make sure I don't run out. 1. Buy a filter - I have to ask around about this. His tank gets very dirty easily. Unfortunately, there is no grip. Maybe I ought to get him something like garage flooring that will give him traction. Any ideas? 3. Start looking at feeder fish and worms. I think he needs other items in his diet. Anyone here an expert on turtles??? Dexter is one big turtle! Do you take him outside once in a while to bask in the sun and eat grass and stuff? Hmm...I dont know a thing about turtles! Sorry love. So he grew with the additional space you gave him? Some animals, including some fish, amphibians, and reptiles are "indeterminate growers." Meaning that they will continue growing as long as there is food and space to support them. That may be the case here. Unfortunately, they don't shrink if you put them in smaller places!